Born and raised in São Paulo, Brazil, Sampa was influenced in his early childhood by different music styles that rocked its dancefloors in the late eighties. Later on, he would rock those dancefloors himself as a DJ playing rhythms like Samba, Samba-Rock, Rap, Funk & Soul of the early nineties. He first came into contact with Forró in 1997/98, when he frequented São Paulo’s Remelexo club together with his Capoeira group. He moved to Switzerland in 1999 and soon established his reputation in the Latin music scene as DJ Sampa. Studying traditional Forró since 2014, he joined the group Forró Vem Vem in 2015, where he works as a cultural producer and DJs weekly at the „Forró da Quarta“ and monthly at the “Forró Vinyl” projects. 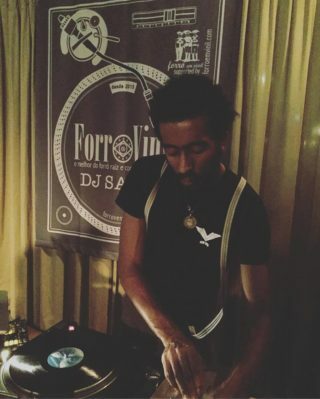 With an impressive vinyl collection on hand, he combines the experience of a professional DJ with his fervent passion for Forró and has been considerably influenced and assisted by renowned DJs like Swingueiro, Ivan and Xeleléu, who passed a lot of their knowledge, experience and musical archives on to him. Since 2015, DJ Sampa has repeatedly enravished the forrozeiro crowds in various cities all over witzerland and Europe, such as Zürich, Basel, Geneve, Milan, Rom, Calabria, Munich, Freiburg, Paris, London, Dublin, Amsterdam, Valencia, Lisabon, Belo Horizonte(Rootstock BRA).